This is the eleventh post in a series looking at the original nineteen ILR stations. This week Plymouth Sound. The smallest of the first ILR stations Plymouth Sound’s studios were in an old organ factory just outside the city centre. In the early days it became apparent that perhaps the service area was too small as the station rarely made much in the way of a profit, a situation only rectified when it became part of the GWR group in the 80s. Setting up the station was local business man Bob Hussell and in charge of programming was David Bassett, an experienced broadcaster at LBC – indeed for a while he was working at both LBC and Plymouth Sound where, like Keith Skues at Hallam, he was a station controller with a daily show. Later he joined BBC Radio Devon when that first went on air in 1983. When Plymouth Sound launched the opening announcement was made by nine-year old Andrew Knight whose name was drawn out of the hat on Westward TV. The launch was not the slickest as you'll hear on the YouTube clip below. At the start there were just 24 staff including administration, four in the newsroom and five presenters –Ian Calvert, Carmella McKenzie, Louise Churchill, Colin Bower, Jimmy Constable as well as David Bassett. Apparently the station used to play an unprecedented 1,100 tracks per week. Nowadays a station like Heart would only play about 700 unique tracks in a month. The Sunrise Sound (what a lovely name for the breakfast show) host was Peter Greig. Peter had worked in the motor trade and run a mobile disco before joining the station. He later became Programme Controller and then moved to Radio South Hams. Until earlier this year he was on BBC Radio Devon, seemingly the destiny of many of Plymouth Sound’s early DJs. After David Bassett’s phone-in it was Mix with Louise followed by Talk with Louise. Louise being Louise Churchill, and yes apparently she was distantly related to Sir Winston. 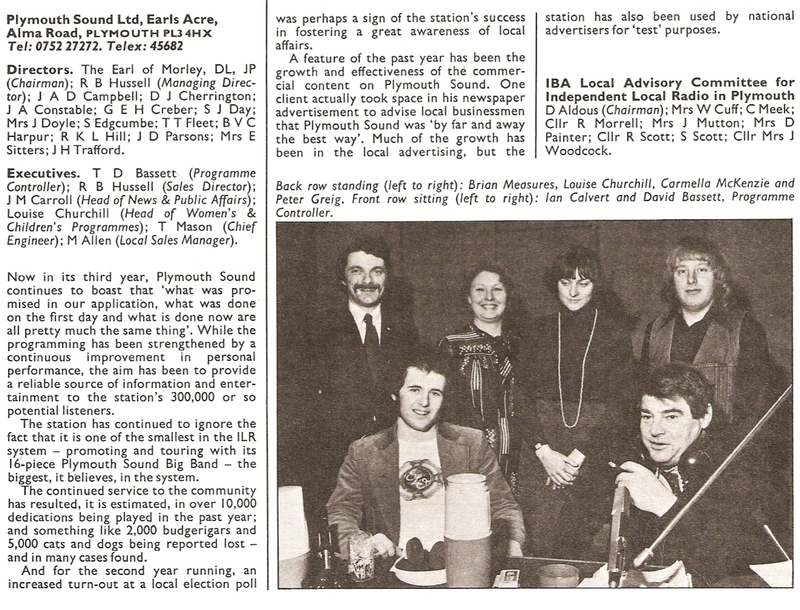 On air for 14 years at Plymouth Sound she went on to became the station director. Back in 1977 she had the title of Head of Women’s and Children’s Programming though the only directly youth-orientated show appears to be the Inter-Schools Quiz on Sunday with “invigilator John Lennard”. 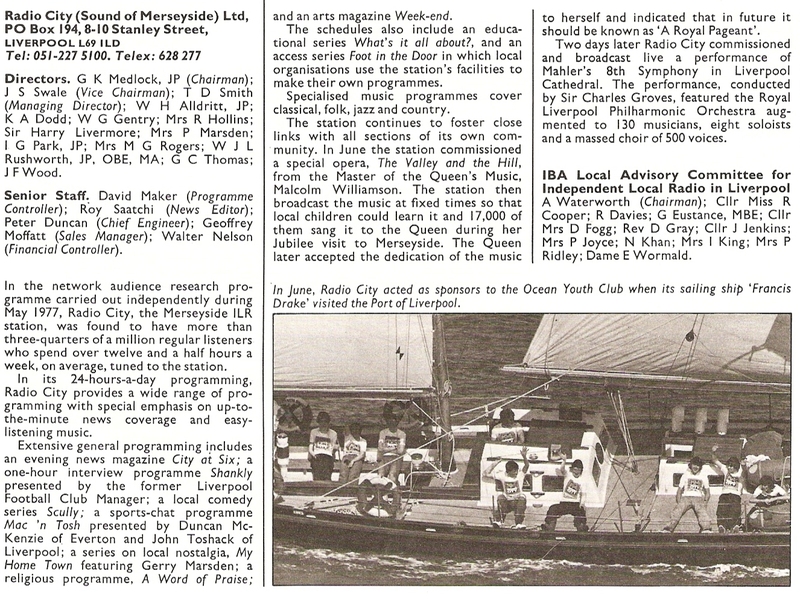 Is this the same John Lennard who went on to be a BBC producer or am I getting confused with John Leonard? Homeward Bound was Carmella McKenzie who had joined Plymouth Sound after working as a technician on the student television service at Plymouth Polytechnic. She’s now a local registrar splitting her time between Cyprus and Plymouth. The evening weekday DJ was Ian Calvert (left) who was with the station until 1992. 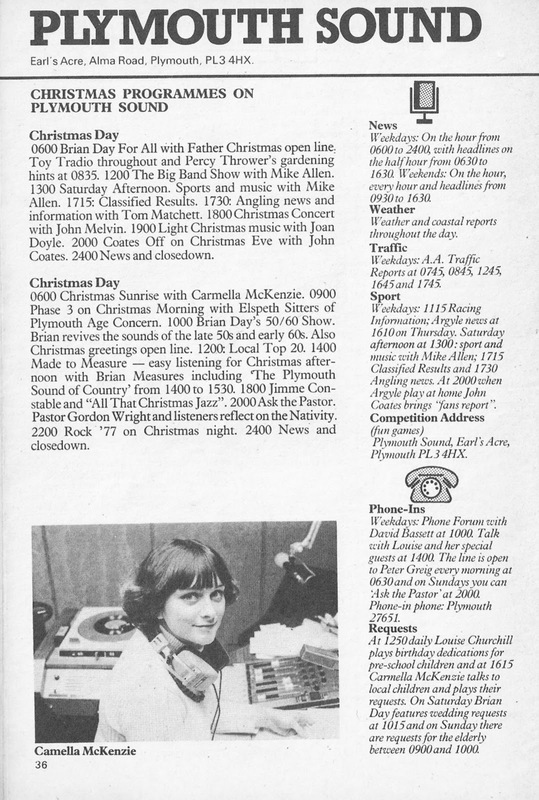 He then hosted the breakfast show on South Hams Radio (now also part of the Heart brand) before moving to BBC Radio Devon. Calvie left the BBC last year to concentrate on his travel business Have A Nice Stay. The early ILR stations loved their punning programme titles so Brian Measures hosted, of course, Made to Measure on Sunday afternoon as well as the late-night Plymouth Sound of Love. Brians’ route into radio was different to many as he’d been with the GPO and the Royal Mail. Now retired and living in Portugal. John Melvin who presented the concert on Saturday evening had started at the station as presenter of a weekend forces request show whilst working as a bank official during the week. I was listening to Greeting Pop Pickers – The Story of Pick of the Pops that was broadcast last night and it set me thinking as to when was Fluff’s first appearance on the BBC. Last night’s programme suggested that he’d done various fill-in shows on both the Light Programme and 208. My own research for my Alan Freeman post revealed that he arrived in the UK in 1957 and was working for Radio Luxembourg in 1958 onwards. As far as I could ascertain he presented Housewives’ Choice in 1960 but I have no exact dates. Did he host any other shows on the BBC in 1959 or 1960 before stating Records Around Five on 5 January 1961? It would appear that Fluff was on BBC television in 1959. 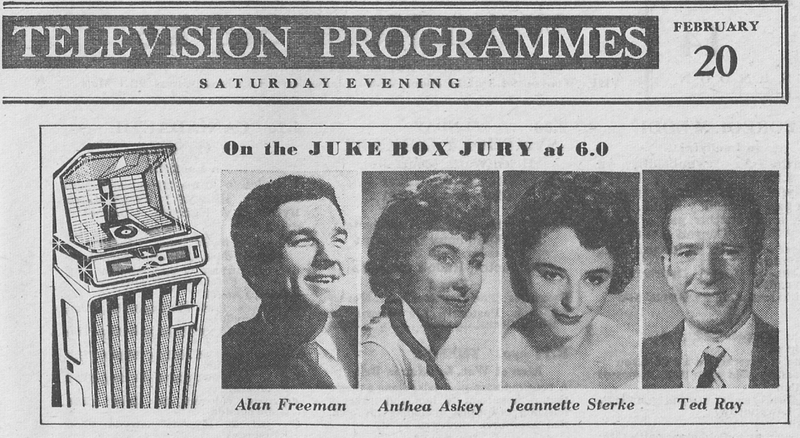 According to the Alan Freeman page on the John Peel Wiki site he was on Juke Box Jury in the summer or 1959 with, of course, David Jacobs from whom he would take over Pick of the Pops two years later. 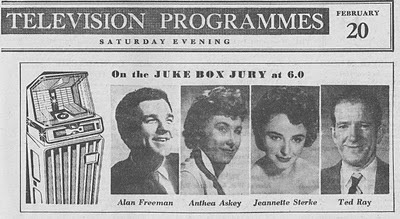 I chanced upon another appearance on Juke Box Jury on 20 February 1960 (see Radio Times illustration above). On this occasion he was on with the panel also consisting of Anthea Askey, actress and daughter of big-hearted Arthur, Czech-born actress Jeanette Sterke and comedian Ted Ray, hardly qualified to comment on the pop records of the day you’d think. If you have any further information about Fluff’s early radio and TV appearances please contact me. 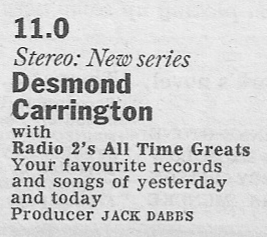 Next month Desmond Carrington celebrates 30 years of his weekly show on Radio 2. Not the same weekly show mind you. 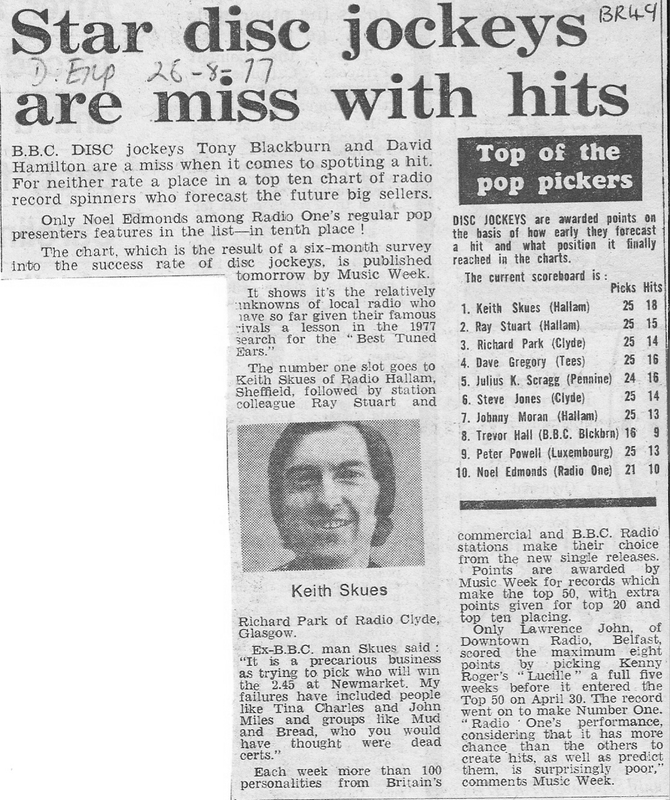 From 1981 to 2004 it was the Sunday lunchtime show All Time Greats before he was ‘demoted’ initially to Tuesday evening and then Fridays presenting The Music Goes Round. Desmond first got in front of the microphone in 1946 on Radio SEAC (South Eastern Asia Command) at its HQ in a palm grove just outside Colombo, Ceylon. His fellow broadcasters were David Jacobs, McDonald Hobley (later one of the first in-vision announcers for the BBC), Charles Chilton (renowned BBC producer who would go on to create Journey Into Space) and Alexander Moyes (who became an actor). Quite a team! Many of his radio appearances in the 50s and 60s were film-related: in the late 50s he presented a Sounds Familiar quiz as part of the Light Programme’s Movie-Go-Round and in 1966-7 he was also on the BBC with Music from the Movies as well as Open House (nothing to do with the Pete Murray series). Desmond broadcast and produced many shows for Radio Luxembourg including Calling the Stars that featured film soundtracks. 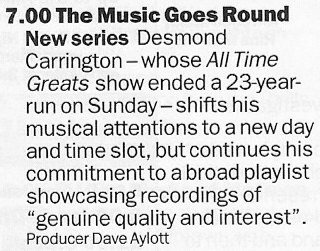 Like many broadcasters, actors and musicians Desmond appeared on Housewives' Choice and he was also on the rota of presenters who hosted Roundabout – the drivetime show on the Light and Radio 2 – and Radio 2’s Album Time in 1969 and 1970. But it wasn’t until October 1981 that Desmond got a regular radio show, although initially it he was contracted for 3 months. In the event All Time Greats ran for nearly 23 years. The show was a mix of modern and classic pop music, show tunes, orchestral pieces and comedy records that worked well in its Sunday Family Favourites slot; indeed the first producer, Jack Dabbs, had worked on that programme back in the late 60s/early 70s. On 29 August 2004 the final All Time Greats was aired. Desmond was obviously not happy about this and neither were his loyal listeners. The following week Elaine Page’s new show started. This is a recording of that final show with Desmond’s emotional sign-off. This is the tenth post in a series looking at the original nineteen ILR stations. This week Radio Forth. Still on air? : Yes. The FM service now carries Forth One and the AM is Forth 2. The best known voice on Radio Forth’s 1977 schedule is Steve Hamilton who, some 11 years later provided the voiceover for STV’s Wheel of Fortune with Nicky Campbell as host. Dumfries born Roland James Hamilton (he thought Steve sounded better as a DJ name) studied drama at the Royal Scottish Academy and would later have bit parts in Taggart, Take the High Road and Monarch of the Glen. 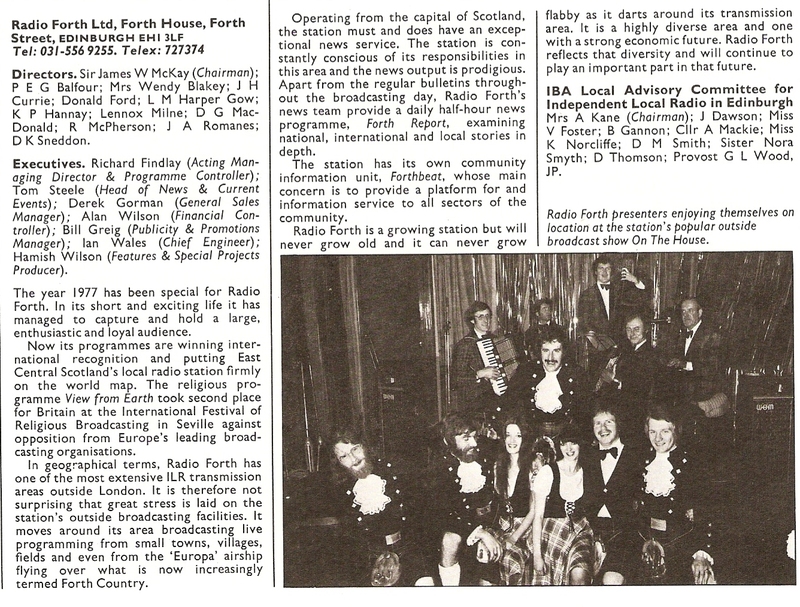 His was the first voice on air when Radio Forth opened, kicking off with local group Pilot’s hit record January. He remained with the station until 1988 by which time he was also a continuity announcer at STV, making the regular commute between Edinburgh and Glasgow. Later he concentrated on voiceover work and ran a voice coaching school, and was on-air for a while on the short-lived station River FM. Steve died after a heart attack in 2009. Morning show presenter Mike Scott (left) had started his broadcasting career on the pirate station Radio Scotland in the summer of 1967. Back on the mainland he trained as a printer before returning to radio and joining Forth in 1976. 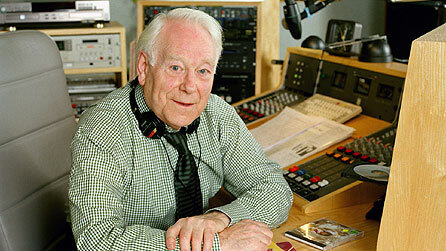 He presented the Breakfast Show for many years and was later Head of Promotions for the Scottish EMAP-owned stations. Presenting An Afternoon Affair was American DJ Chuck Rowell and, other than the fact he was from the States, that’s all I know about him. If you know more please let me know. Afternoon host Mike Gower (Gower Power) was a former club and hospital radio DJ. He was at Radio Forth between 1974 and 1979 before moving into television where he was a newsreader on BBC Scotland and then into TV directing mainly in news and sport. 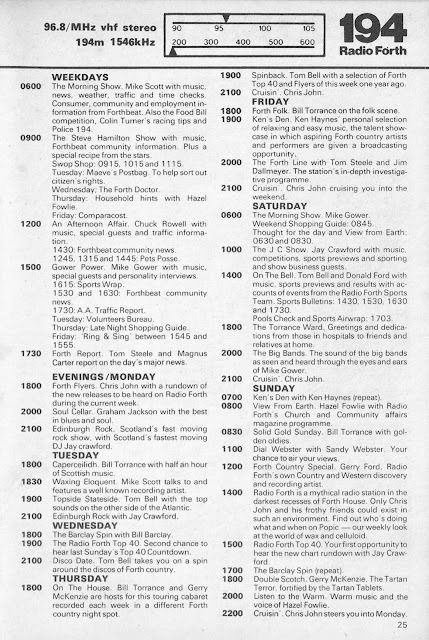 In 1977 Forth still had specialist music programmes such as the Scottish music show Caperceilidh presented by Bill Torrance. Bill was on a number of shows across the week. These days he’s a voiceover artiste but he later became Head of Presentation at Forth, was presenter of the TV programme Beechgrove Garden and DJ’d at Radio Tay and Northsound 2. He’s still on air on Forth 2 every Sunday afternoon. The daily Forth Reports was co-presented by Tom Steele, the station’s Head of News. Tom had come from Radio Clyde and had been a lobby correspondent for the Scottish Daily Mal, a reporter at BBC Scotland and news producer for BBC Radio Sheffield. He went on to become Programme Director and then Managing Director at Radio Forth. He now runs a media consultancy business. The other co-host of Forth Reports was Magnus Carter who’d been a journalist on The Evening Chronicle and The Journal in Newcastle before joining Forth. Magnus was later on the AM programme at LBC, worked on Today on Radio 4, was an editor at IRN and Head of News for GWR Radio. Like Tom Steele he now runs a media consultancy and training business. Weekend DJ and host of Edinburgh Rock was Jay Crawford. His radio career started at Forth where he stayed for 25 years before moving to Radio Clyde and then Scot FM. He is now Programme Director for Real Radio Scotland and Chair of the Scottish branch of The Radio Academy. Looking after the community affairs programming was Hazel Fowlie who would later work for Saga Radio until its Smooth rebrand. 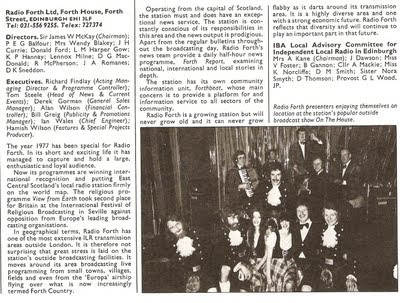 Although not evident from the 1977 schedule Radio Forth had occasional drama series including the long-running Mary Queen of Scots (above). 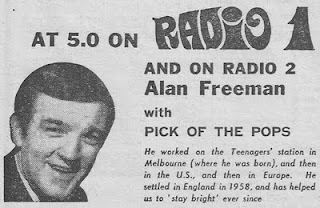 Over the years there have been a small number of Australians that the British have taken into their hearts – Rolf, Dame Edna and Kylie spring to mind – but to that list we must surely add broadcasting great Alan ‘Fluff’ Freeman who entertained us for four decades. This month sees the 50th anniversary of Alan Freeman’s first Pick of the Pops. 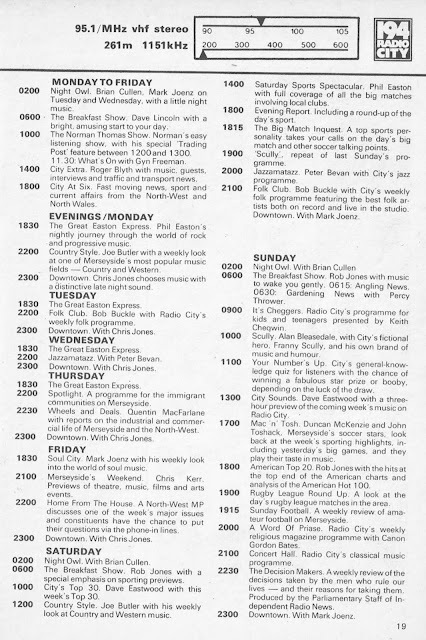 In this post, the second in the Radio Lives series, I’ll recall the key dates of the career of the man I like to call Sir Fluffington, illustrated with old Radio Times listings and audio clips. Young Alan Leslie Freeman’s ambition was to be a singer like his musical idol, the American opera and concert singer, John Charles Thomas. Whilst Alan had a “pleasing baritone voice”, as he later admitted he “never had the vocal equipment” to make it professionally. It was, therefore, on Australian radio where he got to use that voice, first as an announcer then as a presenter at 7LA in Tasmania and then 3KZ in his home town of Melbourne. So it was that Alan arrived in the UK during his 9-month round the world trip but in the event he never returned to Oz. Looking for radio work he auditioned at Radio Luxembourg, where he was judged as “adequate”. Nevertheless he was soon working as a summer relief announcer on 208 and then later as DJ providing recorded shows for the station from their Hertford Street studios. In 1960 Alan did a turn on the Light Programme’s Housewives’ Choice and Twelve O'Clock Spin which eventually led to his first regular show on the BBC on 5 January 1961 hosting Records Around Five – “around five” because it started at 16:48 just after the racing results. 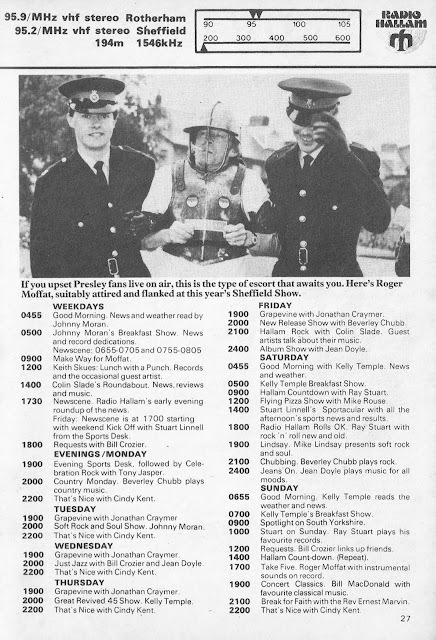 This show was produced by Derek Chinnery, later to be a network controller for Radio 1, and together they chose Brian Fahey’s At the Sign of the Swinging Cymbal as the signature tune. This theme was to stay with Fluff for the rest of his career. By late 1961 Light Programme producers had decided to incorporate Pick of the Pops, at the time presented by David Jacobs, into a live Saturday night show called Trad Tavern. As David didn’t fancy the idea of doing the show in front of the live audience Alan was asked to take over, which he did from 23 September. Here’s David talking to Fluff on the previous week’s show. 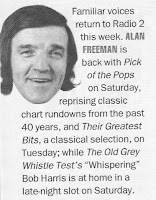 And so Alan started his first stint as host of the weekly chart show which was to last until 1972. 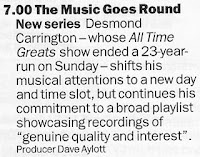 Throughout that run he worked with producer Denys Jones when the show moved to its traditional Sunday afternoon slot from 1962, thus establishing the time and day for chart shows that continues to this day. 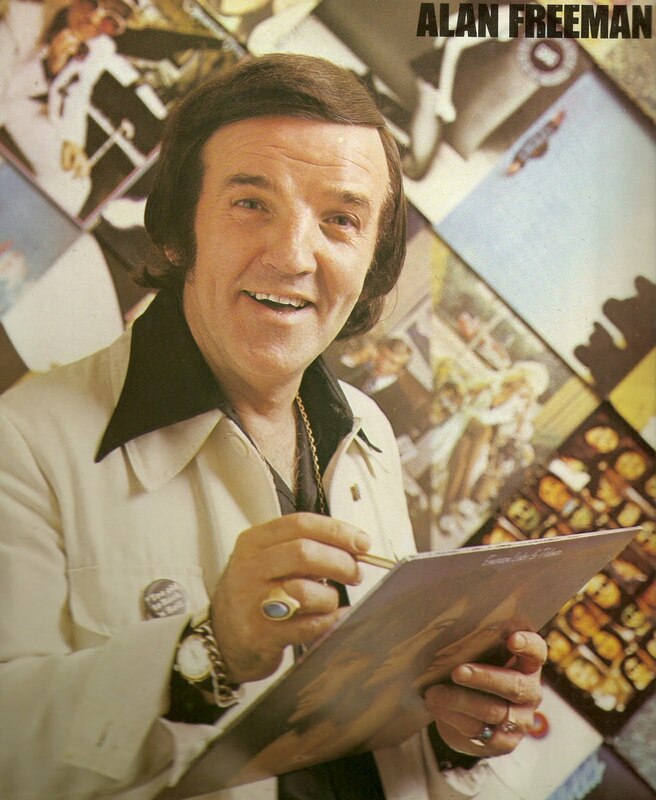 During this time Alan developed the style for which he became famous: the short staccato sentences, his listeners becoming “pop pickers”, the dramatic countdowns, the theme tune used to punctuate proceedings and the segueing of records whilst announcing the track over the intro. Again the Swinging Cymbal was used but this was changed in March 1966 to a Cliff Adams arrangement –he of Sing Something Simple fame – of Quite Beside the Point by the Harry Roberts Sound. By 1970 At the Sign of the Swinging Cymbal was back, this time arranged by Barbara Moore and played by Cliff Adams’s Brass Incorporated. This version is the one used by Alan on this Rock Show and subsequent incarnations of POTP and subsequently by Dale Winton and Tony Blackburn. For any freelance DJs the amount of work on offer from the BBC in the early 60s was still very limited so many also worked for Radio Luxembourg as well, and Alan Freeman was no exception. Fluff continued to appear on 208 throughout the 60s and into the 70s on shows such as Spin with the Stars and Pops Till Midnight, an EMI sponsored show produced by Harry Walters (who would go onto produce Jimmy Young’s show on Radio 2). In 1964 Alan was asked by producer Bryant Marriott to present a couple of Beatles Bank Holiday specials called From Us To You. These gave the Fab Four the opportunity to sing a few songs and enjoy a bit of banter with Uncle Fluff. Here are a few short clips from those shows. From the same stable as TOTP came All Systems Freeman-the producer of both was Johnnie Stewart. Starting on 5 January 1968 this short-lived BBC1 TV series had Alan introducing the big hits of the day. Here’s a fascinating piece of audio of Alan “rehearsing” his chart rundowns. Be warned, there’s a spot of effing and jeffing. Naughty Fluff! 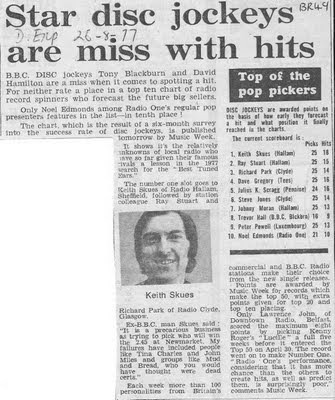 In September1972 Fluff presented his last POTP as a weekly new chart programme – when it returned it was as a retro show- and Tom Browne took over the charts with Solid Gold Sixty. Back in April of that year on Radio 1 Terry Wogan had left his 3-5 p.m. show to move across to Radio 2’s breakfast show and Alan Freeman moved into Terry’s old programme slot. It was in the daily afternoon show that Alan finally broke away from just playing hit singles and got the chance to play the odd rock track with encouragement from his producer Tony Wilson, but much to the annoyance of management. On 1 January 1973 as the UK went into Europe the show came from Rome. Here’s a very short clip, the year is beeped out as it was used in a Radio 1 guess the year quiz; notice that his theme is now Soul Bossanova by Quincy Jones. Yeah baby! 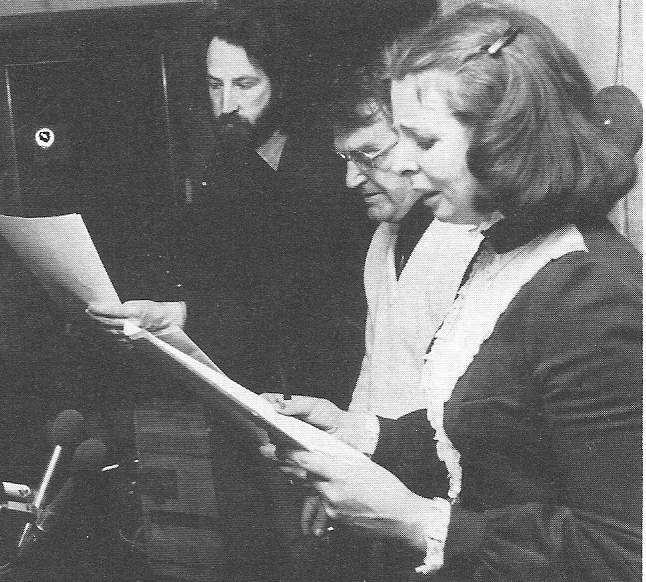 1973 was the beginning of a busy 5-year period at the Beeb for Alan. Although his daily show ended he was given free rein to play all the heavy metal and prog rock he liked on a new Saturday afternoon show starting on 30 June, though he initially thought that demotion to a Saturday afternoon was him being pensioned off. However, as the show went out in stereo on VHF as well as 247 metres (opposite Sport on 2) it soon built up a loyal following. 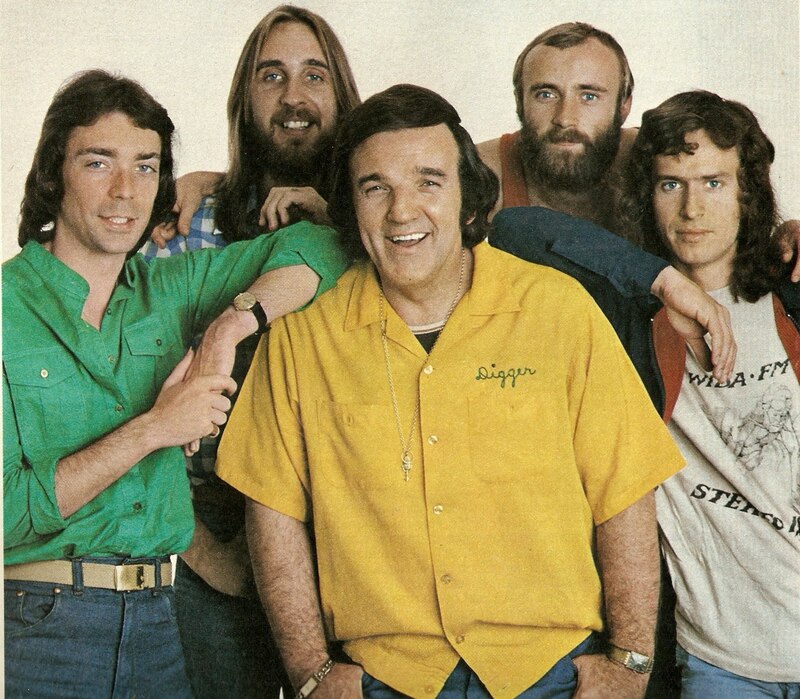 In the summer of 1973 it was Alan who went out on the road in the first ever Radio 1 Roadshow. Developing the Youth Club Call feature from his old daily show he also picked up a Tuesday drivetime show that regularly came from youth clubs around the country. Initially this went out under the old Radio 1 Club title but the idea of the club was dropped in late ’73 and with it went the title. This show ran until 1975. 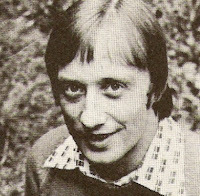 1975 saw Alan in quizzical mode as he was the question master on Radio 1’s Quiz Kid, organised in co-operation with the National Association of Youth Clubs (clip below). Meanwhile that same year he was presenting another quiz over on Radio 2. Free Spin offered the chance for listeners to take part in a music quiz over the phone, an early version of Pop Master if you will, though the programme billing promised a musical range encompassing “grand opera to rock ‘n’ roll”. Alan continued to host the series until 1977; the following year comedian Duggie Brown took over – what a contrast! In 1978 Alan left the BBC – for the first time. His last rock show went out on Saturday 26 August. So unless you lived in London and the south east Fluff disappeared for a while apart from popping up on the odd TV advert. Between 1980 and 1988 Alan was at Capital Radio where he initially revived the Rock Show and then later Pick of the Pops - as Pick of the Pops Take Two combining current hits and an old chart rundown. He still made occasional national radio appearances on ILR’s Network Chart Show, deputising for David Jensen. The Sunday lunchtime ‘oldies’ slot on Radio 1 had became well established by 1987 with Jimmy Savile’s Old Record Club. However, network controller Johnny Beerling thought that Jimmy was now becoming “old hat” so he was replaced by the younger man- Mike Read. When audience figures dropped by over a million Johnny sounded out a replacement for Mike, that someone was Alan Freeman. In the early 60s it was Beerling, as assistant studio manager, that had played in the discs for Alan, no self-op studios in those days. To entice him back to “formidable 1FM” Fluff was offered a package of both Pick of the Pops and a Rock Show. At the age of 61 it was decided that there was no point in hiding it so press officer Jeff Simpson devised a photo call on a double decker bus with Fluff waving his bus pass. Pick of the Pops returned to the Beeb on Sunday 15 January 1989 with the Rock Show starting the previous day. 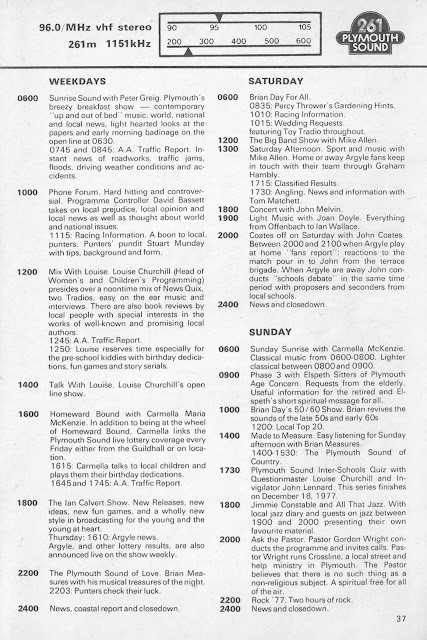 This is an extract from that first programme. 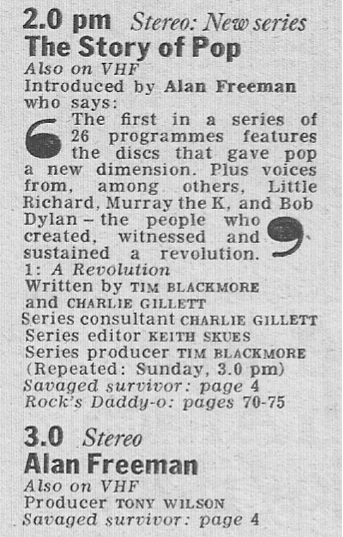 Titled the Saturday Rock Show it was actually broadcast between midnight and 2 a.m. on the Sunday morning (the BBC day tends to run from 6 a.m.) which seems to cause some confusion for Fluff. The show opening more than amply demonstrates that he was still at the top of his game – this is how to start a show. Let’s rock! By 1993 Beerling had decided to retire from the BBC and the incoming Controller was Matthew Bannister. Under his watch many of the old names were dropped in what proved to be a bloody period in Radio 1’s history. Out went DLT, Simon Bates, Bruno Brookes, Bob Harris and Alan Freeman. The last Saturday Rock show went out on 23 October 1993. Producer Tony Wilson managed to get a few old rockers on the line to speak to Alan, you’ll hear Robert Plant (or “Bobbie” as Fluff calls him), Danny Bowes, Ian Gillan, Fish, Blaze Bayley, Joe Elliot and a message from Rick Wakeman. Alan returned to the Capital group the following year where he presented Pick of the Pops Take Three on Capital Gold. His Rock Show re-appeared on Virgin 1215 and he did the odd show on Classic FM, his first love was of course opera. April 1997 saw Uncle Fluff return to the BBC for a third and last time. Radio 2 Controller Jim Moir invited him back with the offer of two programmes: the old war horse Pick of the Pops on a Saturday afternoon and a Tuesday night series of classical music called Their Greatest Bits. A week before POTP returned Fluff spoke to Steve Wright on his Saturday morning show. Meanwhile over on Radio 4 a Kaleidoscope Feature called All Right? Stay Bright? saw Alan reminiscing with his old Radio 1 colleague Paul Gambaccini. This programme aired on Saturday 16 August 1997. Radio 2 certainly had its share of “veteran” broadcasters back in 2000 – Alan Keith (91), Jimmy Young (78), Richard Baker (74), Desmond Carrington (73) and David Jacobs (73). So at 72 Alan Freeman was by no means the oldest. Under the production of Phil “The Collector” Swern most of the Radio 2 POTP programmes had in fact been voice-tracked but a combination of arthritis and failing hearing led Fluff to the decision to hang up his headphones. The last regular Saturday programme aired on 1 April 2000, after which Dale Winton took the helm, but was followed by a Good Friday special a fortnight later in which Alan played 40 years of number 1 hits. He continued with Their Greatest Bits and the eighth and last series concluded on 3 April 2001. Alan’s booming baritone voice was now much diminished with the onset of osteomyelitis in his jaw. By now, following a couple of falls, he was now being cared for at Brinsworth House, a retirement home run by the Entertainment Artistes’ Benevolent Fund. It was there on 27 November 2006 that Alan passed away. This is the ninth post in a series looking at the original nineteen ILR stations. This week Liverpool’s Radio City. Still on air? : Yes, on FM only with the AM service carrying City Talk. It was Radio City’s first Programme Director Gillian Reynolds that brought together the team that launched the station in 1974. Gillian is best known as a radio critic, having worked for The Guardian before moving back to her home city to set up the station. She returned to journalism in 1975 becoming the Daily Telegraph’s radio critic, a position she still holds. Gillian is also a regular broadcaster, contributing to many programmes on Radio 4 and on Radio 2 - she was heard on Round Midnight, Parkinson’s Sunday Supplement and the Radio 2 Arts Programme. Perhaps the best known name in this schedule is Keith Chegwin with his show It’s Cheggers. Keith was a former child actor in films and TV who had a brief singing career (remember Kenny with The Bump?) before joining City as a young DJ. In 1976 he had already started to appear on BBC1’s Multi-Coloured Swap Swap with Noel Edmonds which ultimately led to Cheggers Plays Pop (BBC1 1978-1986) and working on Radio 1 with Tony Blackburn and Maggie Philbin. The weekend Breakfast host Rob Jones started training as an accountant before joining Radio City. He left the station to join Radio Luxembourg as DJ and eventually became Director of Programmes. Rob was one of the presenters of ITV show Breakers, brought in as a last-minute replacement for Marc Bolan. After Luxembourg he moved into television working for Sky and Music Box before setting up his company USP Content.. 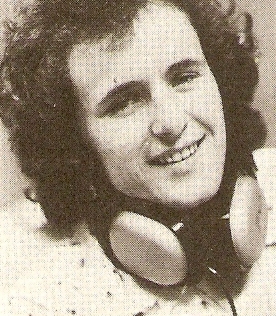 Weekday Breakfast host Dave Lincoln would go on to set up Red Rose Radio in Preston and work for Virgin’s Superstation. These days you can hear him on Smooth Radio. Working overnights and weekends was Mark Jones, or Joenz as he spelt it at the time so that people would remember him, who’d come from BBC Manchester to City. 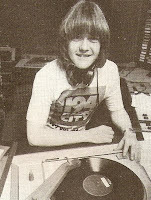 Later he was on Century Radio as well as Magic 1548 in Liverpool and Magic 1152 in Manchester. The other presenter of Night Owl was Brian Cullen who had been at BBC Radio Merseyside and would later broadcast on Marcher Sound and Radio Maldwyn (which closed last year). Sunday evening’s football review show was called a punning Mac ‘n’ Tosh presented by players from the two Mersey teams – John Toshack of Liverpool and Everton’s Duncan McKenzie. Both teams had met earlier that year in the FA Cup semi-final. Staying on a footie theme on Sunday mornings you could hear Scully. Created by the teacher Alan Bleasdale the programme followed the adventures of tearaway lad Franny Scully whose ambition was to play for Liverpool FC. The character was so successful that Bleasdale took up writing full-time and developed the character in a Play for Today in 1978 and a Granada series shown on Channel 4 in 1984. Sadly four of City’s 1977 team have passed away. 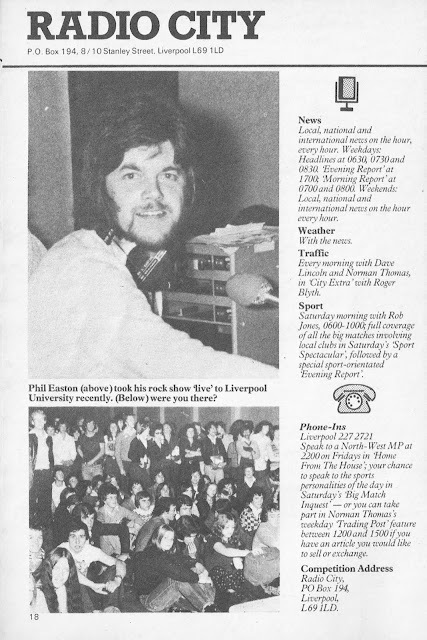 Phil Easton, pictured in the Radio Guide, hosted a nightly rock show. He continued to work at City until the late 80s. Later he was on Orchard FM before joining City Talk. He died suddenly in 2009. Norman Thomas, “Uncle Norm” or “Little NT” to his listeners, later became a household name in the region. After 15 years on Radio City he moved to BBC Local Radio working at Radio Merseyside and Radio Lancashire. He died earlier this year. Roger Blyth was running the Mercury press agency when he joined City and which he continued to jointly manage until his death in 1997. After City Roger worked for Granada TV as the news anchor at the Liverpool studios. Dave Eastwood had started his broadcasting career alongside David Hamilton when they were both doing their National Service. Stationed at Compton Bassett (Jimmy Young had been there for a while during the war) they broadcast to the camp on Compton Forces Network. Hamilton, who had trained as a wireless operator went on to join the British Forces Network in Cologne whilst Eastwood became a Methodist Lay Preacher. But pop music was also his calling and he became a local Merseyside DJ known as “Dave the Rave”. Courtesy of his old mate Diddy David, by now on Radio 1 and a TV announcer, Eastwood started to work for Radio 1 on one of the try-out shows late in 1969 and doing interviews for Radio 1 Club. This led to work at BBC Radio Teeside, Piccadilly Radio and then to City. Later Dave briefly joined Radio Luxembourg before moving to Essex Radio in 1985. He died of leukaemia in 1989. 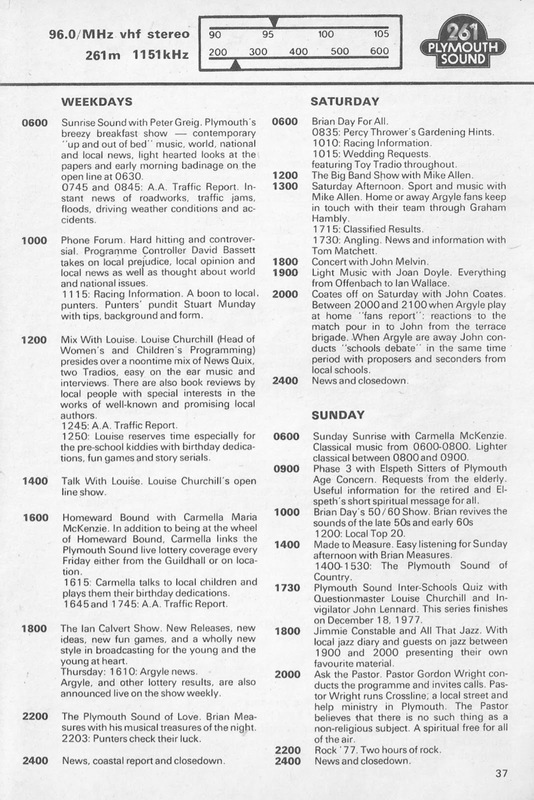 This is the station information published in January 1978. Note that a certain “K A Dodd” was one of the Directors. Next week Jimmy Young celebrates his 90th birthday. In recognition of this Jim is making a one-off return to Radio 2 for a conversation with Ken Bruce. 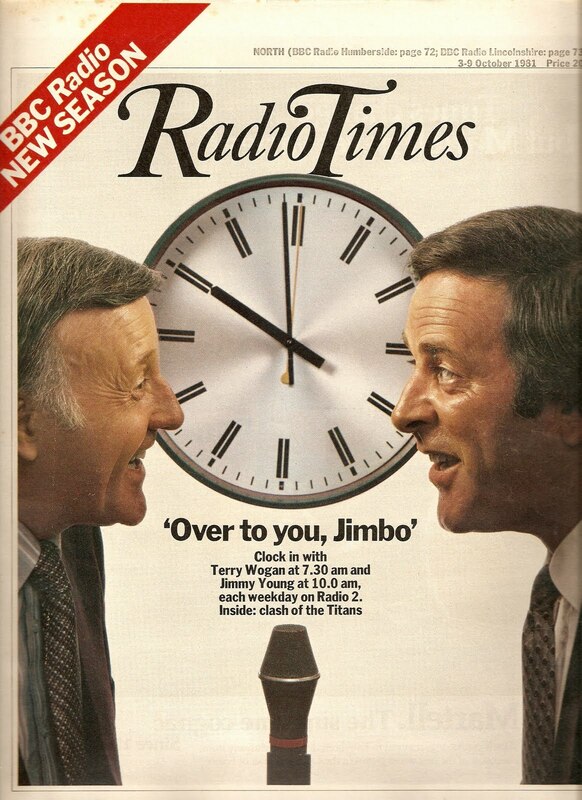 So popular were these morning encounters that Radio 2 gave Jim and Terry a joint show on August Bank Holiday 1978. This is a recording of that show. I edited out some of the music at the time (i.e. by using the pause button) so I’ve tidied up some of these joins and the opening is missing too. The announcer at the end of the programme is Richard Clegg. The show was produced by Geoff Mullin. Please be assured that Jimmy was wearing his vest during this recording. Enjoy the prog! I plan to post a full tribute to Jimmy Young next year. This is the eighth post in a series looking at the original nineteen ILR stations. This week Radio Hallam. Radio Hallam had a strong contingent of very experienced broadcasters, mostly ex-BBC brought to the station by the first Programme Director, the broadcasting legend that is Keith “Cardboard Shoes” Skues . Keith had a wealth of experience on the British Forces Network (BFN), pirate stations Radio Caroline and Radio London, Radio Luxembourg, the BBC Light Programme, Radio 1, where he presented Saturday Club on day one, and Radio 2 where he was an announcer/newsreader and a regular on Late Night Extra and Night Ride. Keith Skues was persuaded to join the BFN in Cologne after he had written to the BBC’s Roger Moffat, at that time introducing Make Way for Music with the Northern Dance Orchestra. After going along to see a recording of the show Moffat advised him to write to the BFN. On being called-up he auditioned and was accepted as a presentation assistant where he shadowed Bill Crozier and Derek Hale before producing his first programme, Canteen Break. He was to repay the favours to Roger and Bill when Radio Hallam started. 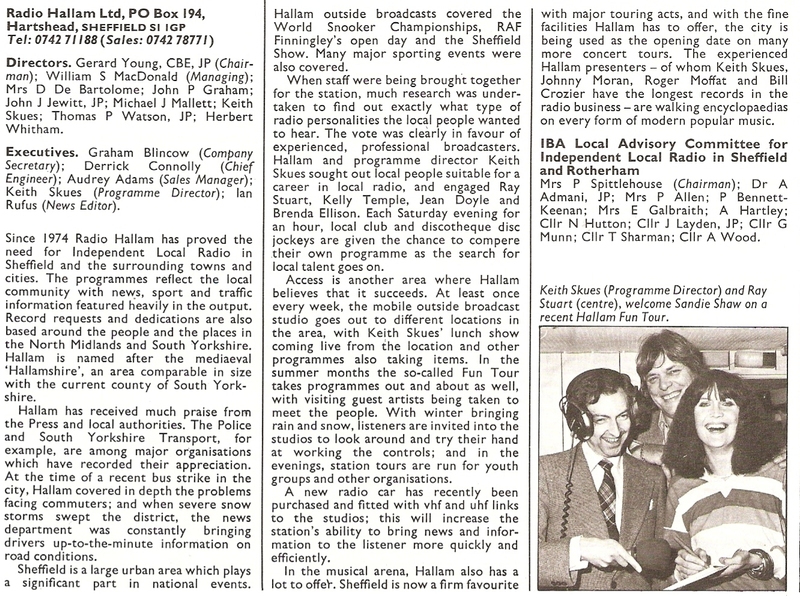 At Hallam Keith continued as Programme Director and DJ, in 1977 it was Lunch with a Punch, until the early 90s. These days you can still hear him every weekend on BBC local stations in the Eastern counties. Along with Keith came Johnny Moran “Your More Music Man” who had been at Radio 1 from the launch. Prior to that he had been one of the last old-style staff announcers at Radio Luxembourg. Bill Crozier was also a very familiar voice on British radio having co-presented Family Favourites with Jean Metcalfe for many years. Bill worked for the British Forces Network in Germany having started there as a producer of Piano Playtime. At Hallam we would have the sound of a nightingale in the background between records, the idea coming from the bird-like “RH” in the station logo. Listeners named the bird, a little unimaginatively, Florence Nightingale. Another ex-BBC announcer was Roger Moffat who was on the first team at Hallam following his firing from the BBC. He had been at the Beeb from the late 1940s and was the duty announcer who closed the old Light Programme in 1967. 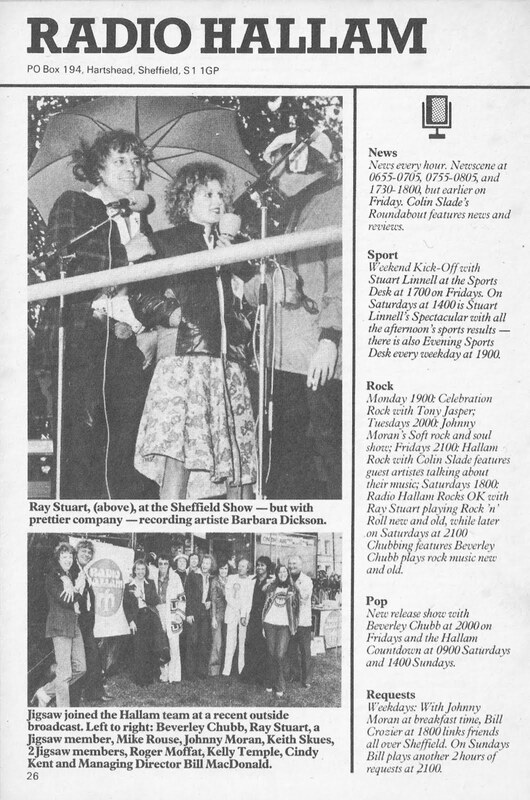 Roger was soon getting into bother at Hallam when he was quoted in a newspaper interview as saying that “what a bloody awful place Sheffield is”. And speaking of BBC announcers when Hallam was launched Radio 4 announcer Peter Donaldson was part of the pre-launch team, though he never made it on the air, before returning to London. 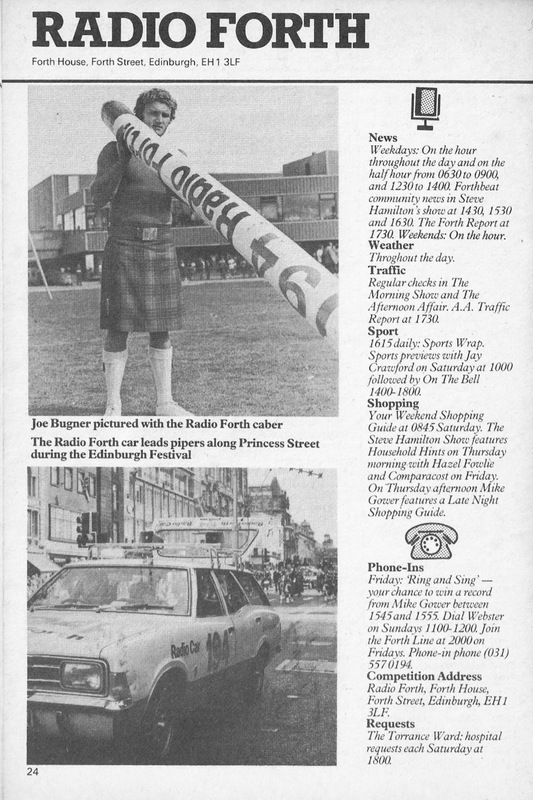 Later in the 70s, I’m unsure of the date, Roger Moffat’s old colleague from the Light Programme and Radio 2 Bruce Wyndham joined the station. After leaving the RAF in 1959 Ray Stuart was in the bands the Main Liners and then Frankenstein and the Monsters. He then worked as a DJ in the pubs and clubs of Sheffield before working freelance for the BBC local station and then joining Hallam. Hosting the Saturday afternoon music and spots sequence was Stuart Linnell. Stuart had started at BBC Radio Birmingham and after Hallam has continued to have a long career at various BBC and commercial stations as well as presenting Midlands Today on BBC1 and reporting for Sky Sports. He’s currently on each weekday lunchtime on BBC Radio Northampton. The other link to Sir Cliff is Tony Jasper who back in 1977 was on Celebration Rock. Tony was a music author and journalist and wrote a biography about the “Peter Pan of Pop”. Amongst his output was also The Top Twenty Book, the fifth edition of which sits on my bookshelf. Tony now writes for and runs the Jasperian Theatre Company and is a Methodist lay preacher.